Don’t be intimidated, the Herringbone stitch is easier than it looks! Just follow our step-by-step turotial and you’ll master this textured stitch in no time. This is a gorgeous, textured pattern - perfect for accessories or home furnishings such as blankets. Don't be put off by the intricate look - if you follow our tutorial, you'll be knitting in herringbone stitch in no time! 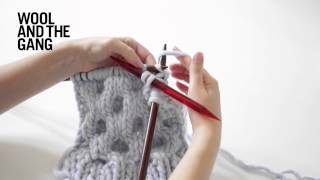 All you need to know is how to knit, how to purl and how to slip stitches, by doing that in the sequence as shown in the video you'll be creating the herringbone stitch. Just make sure to memorize the order in which to do things, practice makes perfect. Let's get ready to knit the herringbone stitch! 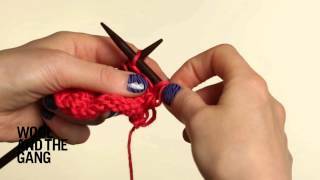 Start off by simply knitting 1 stitch. Then slip 1 stitch knit-wise. Next, insert the left needle into the slipped stitch. 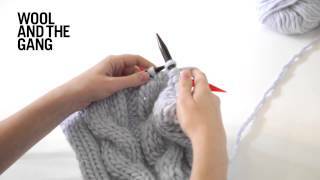 Lift it over the knitted stitch, but do not drop it off the left needle. Insert the right needle into the slipped stitch from right to left. Wrap the yarn, pull it through and complete the stitch as for a regular stitch. Repeat steps 2-7 for the rest of the row. Row 2 (wrong side): Purl 2 stitches together, but don't slip them off the left needle. Purl into the first stitch on the left needle again. Slip both stitches off the left needle. Repeat steps 8-10 for the rest of this row. Then repeat these 2 rows to keep working in herringbone stitch. The wrong side is bumpy, while the right side has a great zigzag texture. We use the herringbone stitch for projects such as the Koselig Blanket. Have fun knitting!